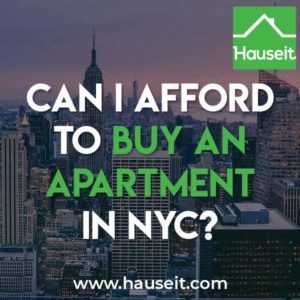 The easiest way to determine whether or not you can afford to buy an apartment in NYC is to use Hauseit’s Home Affordability Calculator. 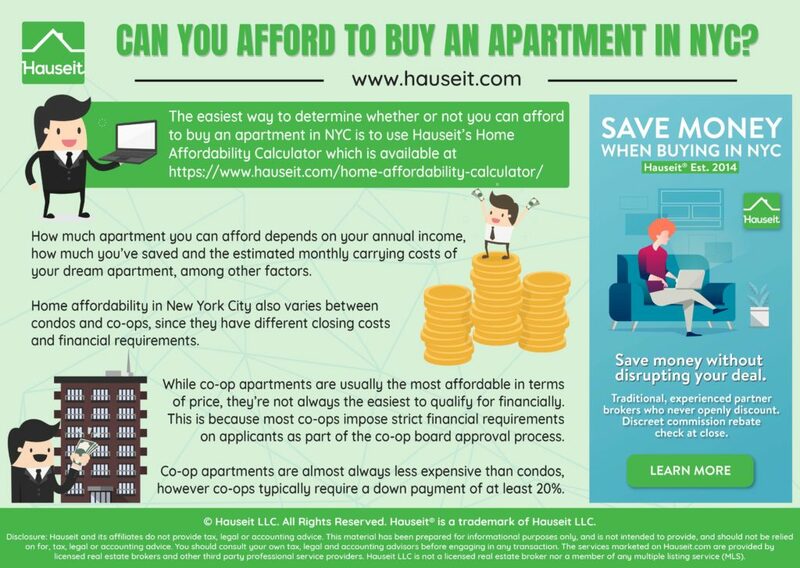 How much apartment you can afford depends on your annual income, how much you’ve saved and the estimated monthly carrying costs of your dream apartment, among other factors. While co-op apartments are usually the most affordable in terms of price, they’re not always the easiest to qualify for financially. This is because most co-ops impose strict financial requirements on applicants as part of the co-op board approval process. How Much Condo Can I Afford in NYC? How Much Does It Cost to Buy an Apartment in NYC? How much co-op you can afford in NYC depends on your annual income, how much you’ve saved as well as the specific co-op building’s financial requirements. Co-op apartments are almost always less expensive than condos, however co-ops typically require a down payment of at least 20%. Furthermore, the income requirements for co-ops are generally stricter than the underwriting standards of major lending institutions. While most banks will loan up to a 43% debt-to-income ratio, co-ops in NYC typically mandate that applicants have a debt-to-income ratio between 25% to 30%. The stricter debt-to-income requirements of some co-ops have a drastic effect on your maximum theoretical purchase price in NYC. Here’s an example we computed using Hauseit’s Mortgage Affordability Calculator: Based on $150k annual income, $1,000 estimated monthly maintenance, and a 30 year loan at 5% IR with 20% down, the maximum purchase price is $999k at 43% DTI and $475k at a 25% debt-to-income ratio. In the example above, the difference between how much apartment you can afford in the case of a condo (without DTI requirements) compared to a strict co-op apartment is over $500,000. This means you’d be able to buy a condo which is twice the price of a comparable co-op apartment, excluding closing cost implications. Stricter co-ops even specify requirements for the type of income which may be used to compute the debt-to-income ratio. It’s not uncommon to see co-op board restrict qualifying income to ‘active’ income as opposed to passive income, such as dividends and social security. While not all co-ops in NYC are strict, the more intense co-ops make it extremely difficult to qualify for board approval. Some of the most out-of-touch co-ops in NYC require buyers to have 1 to 1.5x the purchase price in post-closing liquidity. Since co-op buildings in NYC are permitted to reject an applicant without specifying the reason, many have argued that co-op buildings routinely engage in discrimination. While condos are more expensive than co-op apartments, they may actually be more ‘affordable’ since it’s possible to put less money down and have lower income compared to co-ops. On the flip side, buyer closing costs for condos are on average ~2% higher than for co-op apartments. This means that some of the lower down payment requirement for a condo is offset by the fact that you need more cash for condo closing costs. Buying a condo also has other benefits such as a more flexible sublet policy and fewer overall restrictions on how you can use your own apartment. If you can manage with the smaller space of a condo and you don’t foresee the need to sell prematurely in order to upsize, then it’s probably best to opt for a condo. If you need maximum space and do not foresee moving out of NYC or renting your apartment, then a co-op is your best option. The cost of buying an apartment consists of your down payment of 10% to 20% plus closing costs between 1% to 6%. The most common apartment down payment in NYC is 20% for co-ops, while it’s a bit less for condos since most condo buildings do not mandate a minimum down payment percentage for buyers. The most common closing cost bill for a condo buyer in NYC is 4%, while buyer closing costs for a co-op are usually 1% to 2%. Since your down payment goes towards home equity, the true monetary cost of buying an apartment in NYC is simply your closing cost bill. There are obviously other intangible costs of buying an apartment in NYC, such as the time and emotional energy you invest in the initial search and each phase of the deal: submitting offers, due diligence and the board approval process. Buyer closing costs in NYC are between 1% to 6%. The highest buyer closing costs are for new-construction condos, while the lowest buyer closing costs are for co-op apartments. Co-op apartments have lower closing costs compared to condos. This is because many buyer closing costs only apply to ‘real property,’ and co-ops are not considered to be real property. The practical implicants of co-op ownership are the same as for condo ownership, as you own and are entitled to live in a specific apartment under either ownership structure. With that said, owning a co-op apartment means you receive shares in the co-op corporation along with a proprietary lease which entitles you to reside in a specific apartment. A condo is a more traditional form of real property ownership whereby you have a deed to the unit. Can I Sell an Apartment in NYC Without a Broker?